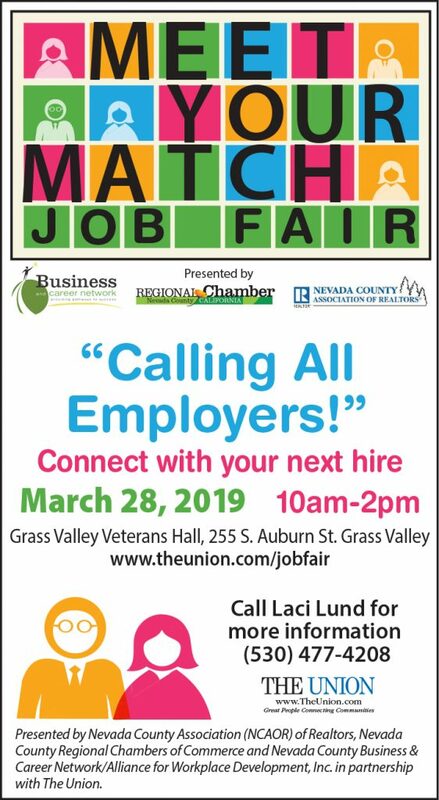 Bring your job skills and willingness to work to the Meet Your Match Job Fair being presented on Thursday, March 28, 2019 from 10 am to 2 pm at the Grass Valley Veterans Hall, located at 255 S. Auburn Street in Grass Valley. Representatives from 20+employers, including the County of Nevada, veteran’s services, non-profits, insurance and real estate services, retail, senior care, staffing agencies, construction, medical care providers and other businesses are eager to meet candidates looking for employment! Job seeker tips to that will help maximize the Job Fair experience include the following: arrive early while employers are fresh, bring extra copies of your resume, prepare a 30-second sales pitch about your strong points, dress professionally, wear comfortable shoes, turn off your cell phone, bring a pen with you and send thank you e-mails or notes to targeted employers within 48 hours of your meeting. The Association of Realtors, Sierra College and the Business and Career Network will be available to provide information about courses designed to teach a trade, prepare for a new career or sharpen existing job skills. If you have questions please email Susan George, sugeorge@earthlink.net or call The Union at 530-273-9561.